The allegations against Islam, since its advent and until the present day, have been repeatedly circulated, the only difference being the wording and the attempt to present them in a semblance of scientific diction. 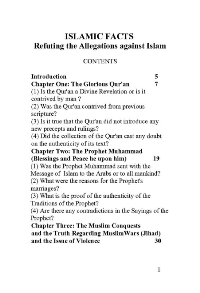 The scholars of Islam answered these allegations each according to his own thought and we do not belittle the efforts of those scholars.The aim of this book is to present conclusive and verified proof regarding the most important allegations against Islam that have been raised and repeated in recent years especially in the age of the Internet. This book deals with some of these allegations.